The 9th Wayfarer Worlds was largely characterized by warm, sunny weather and winds that were usually fairly light. With 53 crews, we had a good representation from across the Wayfarer world - the UK, the US, Denmark and Ireland. The Brits again showed amazing resourcefulness, managing to bring over 16 of their Wayfarers plus the Irish entry in 3 sponsored containers. Only the Danes had to sail borrowed boats - which they did with ability and good grace. Anders Friis in particular had a tough time with a woodie that almost sank before a major epoxy job got it ready in time for the Worlds. Unlike the ‘92 Worlds, this series went down to the final race as the 3 racing giants of the Class, Ian Porter (two-time World Champ), Mike McNamara (defending Champ) and Stuart Rix (UK Champ) battled it out. 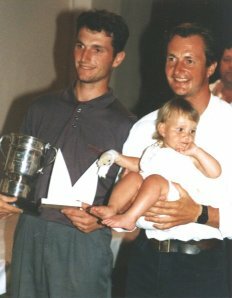 After 3 races, the big 3 were virtually tied but then Stuart Rix and Matt Frary (see photo below with Stuart holding daughter, Megan) won 2 straight races and then held on to win their first Wayfarer Worlds. This came as no particular surprise since Stuart and Matt had dominated the Wayfarer North Americans held on the weekend before the Worlds. Top non-UK finishers were Al Schönborn and Frank Goulay who took until the final race to move past Anders Friis into 6th place. * UKWA Junior Champions, Sarah Brewer and Rosie Frost, got their boat in a different way: W275 was delivered 2000+ miles from the Rocky Mountains of Colorado by Jim and Renée Phoenix, an English couple temporarily located in the US. 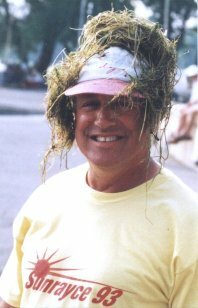 * Principal Race Officer, John Weakley, ran a tight series but with a fine sense of humour: instead of a DSQ for those who failed to meet the safety requirements of signing out and in, John instituted "jerk points" for the offenders who had to buy drinks for the various volunteers on the committees. * an international group was featured in the entertainment as RC Chair, John Weakley, brought out his "concert" gut bucket to play along with Paul Taylor and Poul Ammentorp (guitar) and Jesper Friis (tin whistle) - Anders Friis crew, Bjørn Christiansen amazed us with his extensive repertoire of rude songs while Martin Collen crew, Jeremy Kearns was just a great all round comedian!